Engineering specialist Teddington Systems has launched a new device that could save housing associations and property managers thousands of pounds in boiler breakdowns. Often boilers cut out because of low pressure leading to cold homes and no hot water for tenants. The new PressureSentry device warns tenants when the pressure in their heating system falls too low. Residents can then ring their housing provider to arrange a callout to address the issue. As a result, boiler failures are prevented and scheduled call outs can be arranged rather than managing an emergency call out. It also makes for happier tenants as impending boiler faults can be fixed before their heating breaks down. Teddington says the low-cost PressureSentry device is ideally suited for combi-boiler heating systems and offers a quick return on investment in the savings made on unscheduled call-outs and boiler repairs. 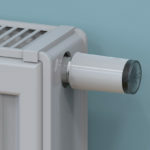 The device screws into the top of a standard domestic radiator to monitor the system pressure and can be installed by qualified engineers during routine service calls — with no need to drain the heating system. Only one per household is needed. The low pressure, caused by leaks or a build-up of trapped air, is behind many emergency call outs — leaving housing providers facing costly repair bills and tenants without heating and hot water. Once alerted by the tenant, property managers can then arrange for work to re-pressurise the system — preventing further damage, boiler shut downs, and extensive emergency bills.